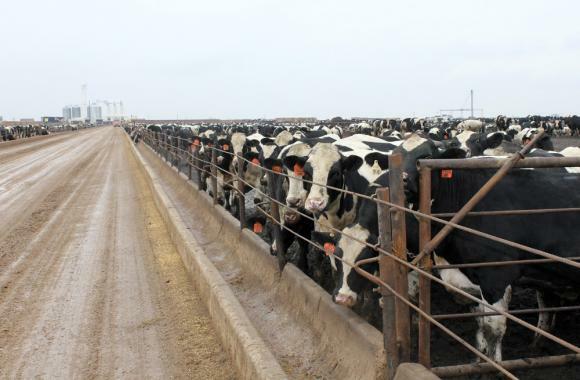 Some 6,500 Holsteins are “finished” at this 2,000-acre Ordway, Colo., feedlot, where the growth promotion drug Zilmax is no longer used because it was pulled from the market by its manufacturer. But Karney is no longer feeding his cattle Zilmax, since the drug’s manufacturer, Merck Animal Health, suspended sales last August. That move followed the four largest U.S. beef companies placing a temporary ban on buying animals that had been fed the additive, citing animal welfare concerns. These moves, which shook the cattle industry, have focused attention on a feed additive that most people have never heard of but one that has become a huge -- if controversial -- part of U.S. beef production. Zilmax, known generically as zilpaterol, is derived from a family of drugs called beta-agonists. They act much like a steroid, turning fat into muscle, creating big body-builder-like bovines. The drug was a “game changer,” Karney said, offering the cattle industry a technology that it rarely sees and coming during a difficult time of drought and high feed prices. Before Zilmax was pulled from the market, an estimated 60 to 80 percent of American beef was estimated to be produced with beta-agonists, according to the University of Nebraska-Lincoln Extension Service. Now most producers are using Optaflexx, another beta-agonist whose generic name is ractopamine, said Chris Reinhardt, a Kansas State University feedlot specialist. Optaflexx is made by a rival drug company, Eli Lilly & Co., and can put up to 24 pounds on an animal in an animal’s final days. “We’re disappointed to lose that tool because in the cattle feeding business, it is about trying to get as many pounds as possible, because every pound is money in the bank,” said Colin Woodall of the National Cattlemen’s Beef Association. As fast as Zilmax piled the pounds on the animals, problems popped up, publicized by a high-profile animal scientist. “You push the biology too hard, then you start to have problems,” said Temple Grandin, the Colorado State professor known for her work making slaughterhouses more humane and made famous in an HBO movie. Grandin began noticing problems not at the feedyard, but at the packing plants. Cattle seemed to be heat-stressed, stiff and sore, what she described as looking like they were “walking on hot metal.” Grandin said she hadn’t seen that kind of behavior in 40 years, not until the recent, persistent use of beta agonists. Reports that the meat produced by beta-agonists lacked in tenderness and taste are not recent. Many academic studiesrevealed the problem, as a much-cited report in the Chronicle of Higher Education. Some argue that beef raised with grass or grain is better tasting and more marbled. Merck insists that Zilmax, which is FDA approved, is safe. The company is working on a “five steps to responsible beef” plan, which calls for an advisory board to review how the drug has been used. The company is also working on a certification plan, which would be a new process that calls for qualifying feedyards to use Zilmax. Beta-agonists have been used in beef production in the U.S. since 2003 and in raising hogs, using ractopamine, since 1999. (Beta-agonists are approved for use in turkeys, but are not used as much as the beef and pork industries.) In addition to the U.S. and Canada, the drug is used in roughly 23 countries. Beta-agonist are banned in 160 countries in Asia and Europe, which fear that the drug can affect humans, such as triggering increased heart rates. In the most recent dust-up revolving around beta-agonists, Russia, the No. 6 market for American beef and pork, halted U.S. beef imports, insisting that the product be free of ractopamine. The beta-agonist bans are also affecting the pork industry. Just a week before the May announcement that Smithfield Foods, the world’s largest pork producer based in the U.S., would be sold to the Chinese, the company announced that it would beginproducing half of its products without the use of ractopamine. “It’s really a stark, bright line between the way U.S. regulators look at these materials and what happens in the European Union and other developed countries,” said Mark Kastel, a co-founder of the Cornucopia Institute, an advocate for sustainable and organic farming. Although the U.S. allows the use of beta-agonists, the Agriculture Department last month launched a new program called the “beta-agonist free” certification, hoping to create sales in overseas markets. Kastel said there’s precedent for that in the U.S. food system – lots of produce and meats are grown with drugs and antibiotics for American consumers while the same products are kept free of those agents for overseas markets. The same hold trues for genetically-modified crops, he said. “If you’re growing for an export market, you’re going to grow these without GMOs. If you’re growing for domestic markets, you can do whatever you want,” Kastel said. The beef industry is happy about the USDA’s new “beta-agonist free” certification, Woodall said. . Producers welcome the new marketing tool for foreign sales because so many countries have banned US exports, he said. Back at the Ordway Feedlot in Colorado, manager Tyler Karney has switched to feeding his cattle Optaflexx. It’s not as effective as Zilmax, he said, and he hopes that product will soon be put back on the market. He trusts that Merck will use scientifically-reliable drug trials done by academics, he said. “The only thing that I feel is that we didn’t make a science-based decision on (Zilmax). It was kind of on emotion,” he said. Grandin, who recently created a “lameness scoring system” to study cattle fed beta-agonists, said she thinks the product will be brought back, but with some restrictions on dosage.